Want to know how to boil an egg just right? Well, you know that little red lion that's printed on every egg in the UK? He's now got a use other than making your eggs look pretty. Of course, it looks like you'll have to buy the right box of eggs to start off with. 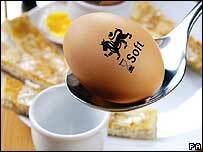 Which means if you buy the "soft" pack, and you fancy a hard boiled for your egg mayo sarnie, you're buggered - unless, like me, you can boil an egg.